Ask fellow campers about "Panorama Camp" and nearby attractions. The price of $43 per night is in Canadian $. This campground is basically in Ontario cottage country, on Lake Nipissing. There are cabins to rent & most of the RV's seem to be people who use them as summer cabins, or people who come for a long stay in the summer. The lake is shallow, so is great for young children. We stayed 2 nights & used it as a short rest stop after we crossed into Canada at Sault Ste. Marie, on our way to Algonquin Park. The hosts are very friendly & helpful. It is a nice setting & very peaceful. We camped at Panorama Camp in a Travel Trailer. Rate in Can $, including taxes. Fairly spacious site 1 with water, 30A and sewer. Trees for shade. Can choose open grassy sites backing onto the lake with 15A for same price. Showers very small but fairly clean. Toilets not easy to flush, and often weren't. Many seasonal but quiet and relaxing place to stay a few nights. Good gravel road in. 11kms to Verden(laundry) and about an hour to North Bay. We camped at Panorama Camp in a Fifth Wheel. This is a very clean lakeside camp ground on the west arm of Lake Nippissing. It is owner operated and shows in the hospitality and effort. There are many seasonal users who were quite friendly. Water front sites have water and sewer only. Many of the full service sites have excellent views of the lake. All grass. 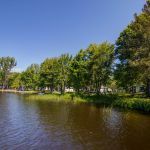 The campground caters to fishing enthusiasts and provides boat rentals on site. Recreation is water based with rafts bikes and floats. We will return. We camped at Panorama Camp in a Fifth Wheel. Are you affiliated with Panorama Camp ?